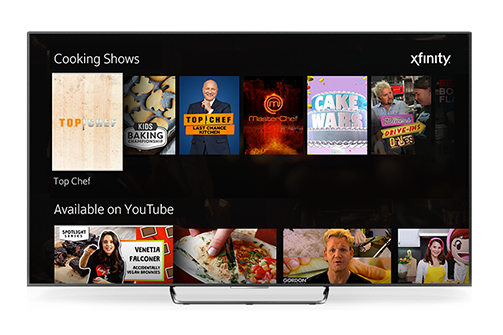 Comcast, Google team up to bring YouTube to Xfinity X1 platform. As if you needed another reason not to leave your couch, Comcast and Google have teamed up to bring YouTube directly to the expanding Xfinity X1 platform. Xfinity subscribers now have access to the never-ending rabbit hole of YouTube videos, which are featured both throughout the Xfinity On Demand menu and in the platform's YouTube app. What do Comcast's in-house smartphone sales mean for your bill? "Giving our customers seamless access to live, on demand and internet content in one place continues to be a key part of our strategy and we are excited to now add YouTube to the X1 experience," Comcast said in a news release. "By adding billions of YouTube videos to our video platform, we are taking our role as the aggregator of aggregators to a new level and reaffirming that X1 is the best place to easily discover and access all types of entertainment with the sound of your voice." For YouTube, the deal opens up a dominant pipeline alongside its traditionally mobile and desktop-based viewership. "The living room is YouTube's fastest growing platform," said YouTube chief business officer Robert Kyncl. "We are excited to supercharge our distribution there and bring Xfinity X1 users a seamless way to consume all of the content they love." Xfinity subscribers can easily call up YouTube videos or search for concert livestreams using the X1 voice remote. Those who have established YouTube accounts can also access their personalized settings by logging in through the app on X1's Apps and Networks sections. The addition of YouTube, which launched its own competing television service earlier this year, comes after Comcast debuted a native Netflix app on the Xfinity X1 platform last November.